Headlines suggest (as do their articles) that as a gravitational result of Cassini's final flyby of Titan, it's fate is sealed and it's orbit is destined to take it into Saturn's atmosphere on September 15, 2017, with 22 complete orbits happening first. What phenomenon is causing this clockwork-like certainty? At Earth, passive drag-induced de-orbit and re-entry is hard to predict in part because the upper atmosphere is constantly changing due to the influence of the sun and solar wind. Saturn's atmospheric scale height is almost 60km which means that the atmospheric pressure increases much more gradually with decreasing altitude than that it would in Earth's atmosphere, but I don't know if that has anything to do with it or not. Is it repeated atmospheric drag during each periapsis that will result in the systematic orbit-lowering that will bring Cassini into Saturn's atmosphere on the 23rd periapsis after the Titan flyby, or is it some other force that is causing this to happen? Here's a plot of data extracted from the JPL Horizons database. 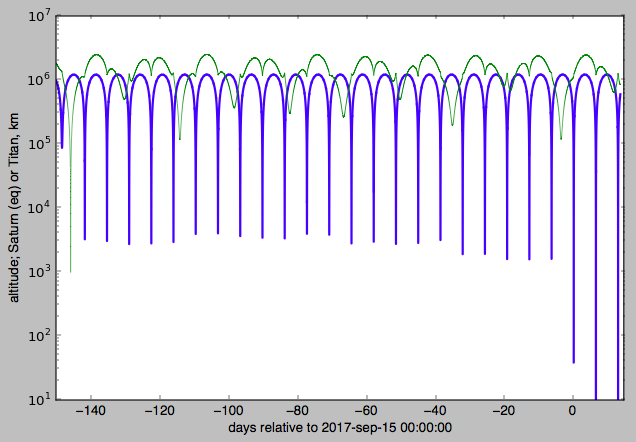 Altitude above Titan (thin green line) and Saturn (equatorial radius assumed) (thick blue line) as a function of time relative to an arbitrary 2017-sep-15 00:00:00 utc (JD=2458011.5) the day of the entry into Saturn's atmosphere. Data were downloaded and plotted at 10 minute intervals. The Titan swingby is indicated by the thin green line reaching down to 1000 km on the left, the planned incineration is the thick blue line approaching 30 km near 2017-sep-15. It looks like the simulation was run longer just to see what would happen. It's some other force. In particular, it's that last approach to Titan on September 11 that will send Cassini deep enough into Saturn's atmosphere so as to make the spacecraft burn up on September 15. Notice that your graph shows that Cassini will make several somewhat close approaches with Titan during the next several months. Some will raise Cassini's Saturn periapsis, some will lower it. The encounter on August 8 (more or less) will make Cassini just barely dive into Saturn's atmosphere at periapsis. The September 11 encounter seals Cassini's fate. There is no recovery from the deep dive into Saturn's atmosphere that will result from that final encounter. Not the answer you're looking for? Browse other questions tagged orbital-mechanics cassini drag or ask your own question. If Cassini's final flyby of Saturn's moon Titan is the 127th Titan flyby, why is it called “T-126”? Could Cassini crash land on Mercury? How can Cassini be a source of potential biological contamination? Why are we concerned about Cassini contaminating Saturn's moons when we landed Huygens probe on one of them?